Gregory Hines revolutionized the tap scene in the '80s and '90s with his incredibly charismatic, effortlessly virtuosic performances on Broadway and the big screen. Now, the trailblazing entertainer—who died in 2003—is being recognized by the US Postal Service with a commemorative stamp. And we are SO HERE FOR IT. The stamp, which will debut January 28th, is part of the USPS's Black Heritage series, and features a classic Jack Mitchell portrait of Hines. If you're in the NYC area, stop by the day-of-issue event at Symphony Space on the 28th (it's free!). If you're not a New Yorker, no worries: The stamps will be available for purchase online and at local post offices. You Can See Broadway's "An American in Paris" in Movie Theaters TODAY! Couldn't make it to the Tony Award–winning Broadway revival of An American in Paris? Or DID make it to the show, but now miss it like ca-razy? Either way, we have fabulous news: Both today and Sunday, September 23, movie theaters across America are screening the gorgeous musical, directed and choreographed by Christopher Wheeldon. The broadcast performance, which was filmed in London's West End last year, features the show's original stars, former New York City Ballet principal Robert Fairchild and former Royal Ballet first artist Leanne Cope. It's pretty much impossible not to swoon for the show's beautiful dancing, not to mention the iconic Gershwin score. Check out the trailer below, and click here to find a screening near you! Happy birthday, Gene Kelly! The dance icon would've been 106 years old today—and his legacy still burns as bright as ever. We thought we'd honor the incredible performer with a look at five of his greatest routines ever. Congrats to the 2018 Capezio A.C.E. Awards Winners! What's better than a competition that gives promising choreographers a whole bunch of funding? How about a competition that also puts on a must-see show as part of the process? That's the genius model of the Capezio A.C.E. Awards. Every year since 2009, the contest has brought upwards of a dozen finalists, selected from a pool of hundreds of applicants, to present their choreography in a fabulous showcase at the Dance Teacher Summit. On Saturday night, we got to see the work of no fewer than 21(!) talented finalists in this year's performance. Happy Nationals season, everybody! It's that time of year when us lucky editors get to watch so, SO many gorgeous solos by dancers competing for big titles. But even among the insanely gifted artists at the top of the comp circuit, Tate McRae stands out. Just ask anyone who's seen the solo that helped her win Teen Best Dancer at The Dance Awards in Vegas last week. Choreographed by Travis Wall (naturally), "Woman" is virtuosic both technically and artistically. Are the 180-degree extensions and fluid lyricism that captivated "So You Think You Can Dance: The Next Generation" audiences two years ago still there? Of course they are. But Tate also approaches the solo with a commitment and maturity that's rare in industry veterans, let alone 14-year-old students. We have so much ❤️ for the Capezio A.C.E. 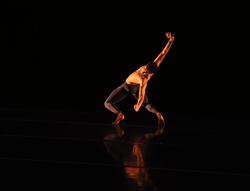 Awards, the annual competition that highlights gifted emerging choreographers from all over. Since starting in 2009, it's become an eerily reliable predictor of the Next Big Thing in choreography. And that's not an exaggeration: Past winners include Travis Wall, Al Blackstone, Melinda Sullivan, Talia Favia, and Martha Nichols. Ah, the quest for the perfect, foot-flattering, technique-enhancing pointe shoe: It can feel like a never-ending saga. Still on the hunt for that ideal pair? Then you won't want to miss The School at Steps' annual Pointe Shoe Workshop and Fair, happening this Sunday, April 22nd, at 6:30 pm in NYC. You've no doubt heard that the fabulous Alicia Vikander is playing Lara Croft in the newest iteration of Tomb Raider, which hits movie theaters this Friday. But while her training for the high-octane action role was crazy tough, she says, studying at the Royal Swedish Ballet Schoolwas far tougher.